Statues, portaits, propaganda for his books, slogans.... it's all about him, HIM, HIM. If you want to create a parody of a megalomaniac dictator, look no further, HE is your man ! His name is Saparmyrat Niyazov, calling himself "Turkmenbashi the Great" (leader of the turkmens). 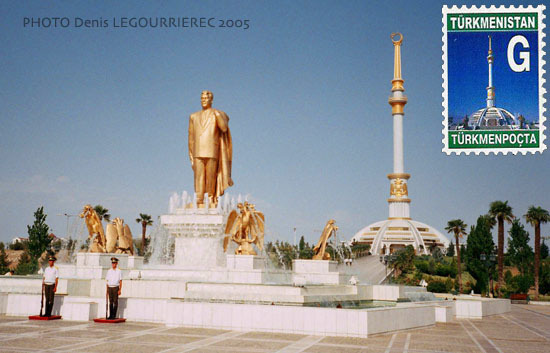 He has transformed Ashgabat. The centre is almost devoid of life. Pedestrians are very few, and most of the people in the many large parks are those taking care of the lawn, flowers etc... The large square between the government buildings is very empty, but if you try to take photos, you realise that there are a few people around : some guards whistle from somewhere to tell you "no photos". So you continue and you reach this big sort of tripod, on top of which is a gold-covered statue of the president that rotates to follow the sun. You can go up the 1st level on a sort of lift that goes up one of the legs of the tripod. Traffic flows under this monument, and the panorama on the city is quite good from the viewing platform. And no guard tells you to pack your camera, although you take photos of the very same government buildings. There are not only statues of himself, but also a lot of posters, and he actually got his grey hair "rejuvenated" to a perfect glossy black, trying to keep a young look. 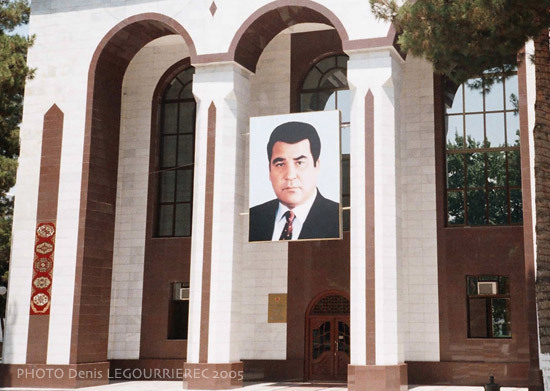 Near the "tripod" monument is another government building with a large portrait of the president. Hung on the facade of many buildings, you see large posters advertising for the "Rukhnama" ("book of the soul"), a series of book written by the president. On several occasions, I stopped walking at a street corner to look at the statues or posters of the president, and a policeman would come to ask me to get moving. "People, Nation, the great Leader of the Turkmens". When I was travelling by minibus across the Karakum desert, at one of the stops to fix a breakdown (see story), one of the other passengers asked me in russian "what do you think of Ashgabat ? ". I said "hmm... interesting.. but quite bizarre to see everywhere all those statues and posters of your president". They laughed and he said "ahh... Allah !!" as in "he thinks he's God", and quickly "shhh.... diktatur...! ", crossing his fists showing he could be arrested for saying that. 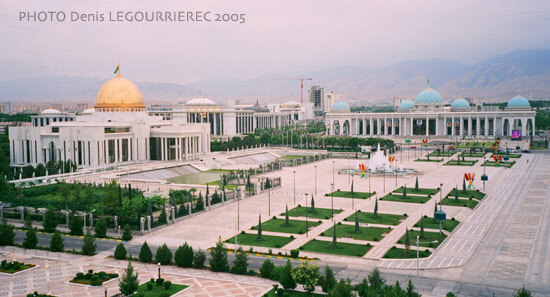 Turkmenistan is a country with resources, and could be a prosperous. Their president surely is as he pockets the benefits from gas and oil exports. The monuments to his own glory are made of white marble and cost a fortune. Note that many of these are built by a french company : Bouygues. As we say in french : "l'argent n'a pas d'odeur" (lit. "money has no smell"). Meanwhile, local people survive on a 30 $ pensions, with the threat of their home being bulldozed to make space for more constructions. 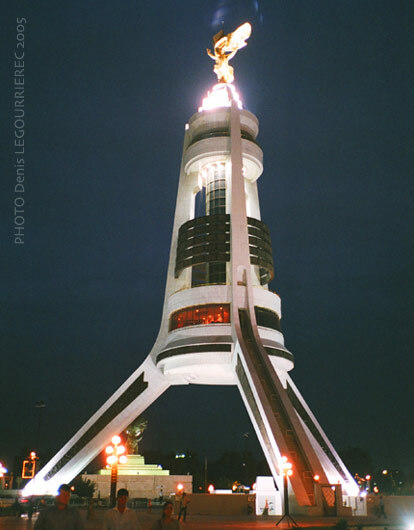 Someone told me "He is a good man, Ashgabat is beautiful now, there was nothing to see before, and thanks to him, we don't pay electricity and petrol is very very cheap". Sounds very "official" doesn't it. Well this guy was in the military actually.... It's true tough : petrol costs... well they did not seem to know exactly : "one dollar, may be 40 liters". 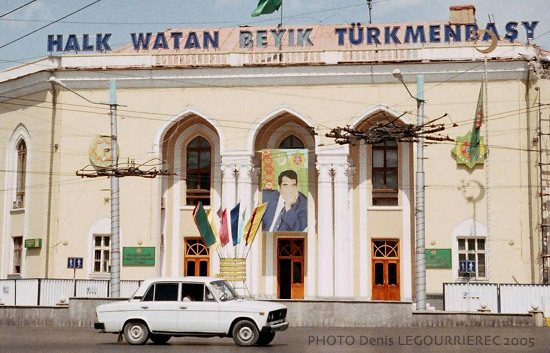 Most people in neighbouring countries laughed when I mentioned the Turkmen president : "ha ha ... he's mad"... or "we call him 'Super'myrat Niyazov"... but for locals he's no joke.